Staircase railings are one of the most important feature that adds beauty to residential i.e. homes, bungalows, etc. and commercial structures like offices, hotels, etc. Staircase railing serve as both. Functional as well as decoration purpose. Staircase railings can be made of different materials like SS, wood, aluminum, glass, iron, etc. Wood and iron railings are often used for residential and office purpose. Staircase railings i.e. the vertical bars and handrails are often hollow pipes. These hollow pipes and thick enough to have a good grip while climbing, making a bold statement to railings. Not only that, railings are used for provide strength sometimes. Well the main purpose of Staircase railings is to provide support while going up and down the stairs and safety too. Safety from falling down. The hollow pipes used for staircase railings for residential purpose are usually made of SS i.e. stainless steel, MS i.e. mils steel or Bright Steel. Staircase railing made of SS are typically silver in color. So next time when you find a silver color railing, you know it’s made of SS. Whereas mild steel and bright steel can be painted are powder coated to almost any color. Stair treads and risers are minor, but essential feature that home owners shall look for during installation. Safety come first be it anything. For staircase home owners shall check for the distance between baluster. The poles shall be near enough for kids not to get stuck between the poles. Check for no pointed iron of steel for the railing design chosen. •	Quantity i.e. number of floors the railings are to be installed. The cost of staircase railing also will increase if it is to be installed on higher floor. Higher the floor, cost increases. This is because the manpower and labor work increases for all the materials to be carried on higher floor. Bungalows are more often seen in hill stations like Pune, Lonavala, and other places. Bungalows are very rarely seen in places like Mumbai. 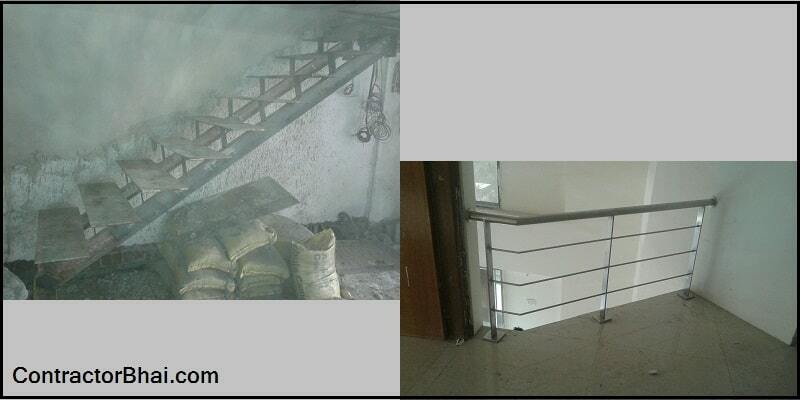 For staircase railings, the man power, raw material, machinery and other material required are all sent from main city due to unavailability of these materials in every city. Let’s say staircase railings needs to be done for bungalow in Pune or Mahabaleshwar, all the required material is sent from Mumbai. Therefore the cost of installation for such distant places increase due to transportation cost involved. If a staircase railing costs 1500/- per running feet, the cost of the same railing will increase by 500/- to 600/- per running feet if transported to other cities.